What do you do with some of your outdoor items when they are not needed. Having a place to store them without taking them inside is a great option. 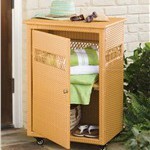 Look at some of these ideas for outdoor furniture with storage, you will like some of these options. We will look at the different types of storage to be found for your outdoor space. Depending of the size of the items that you are trying to store, you may want to look at the different sizes of outdoor storage. Now lets look at some of my options and see what size will work best for you. A resin or wooden bench can have storage under the seat. These are decorated with a cushion of your choice to match your decor. The seat lifts up to let you store your goods. These are fairly watertight,but the resin will keep out the weather better. The two main styles are one with a back and arms or just a flat box. Some method will be necessary to keep the insects at bay. Storage benches can have a capacity of 35 to over 100 gallons of storage for your goods,depending on the size you have. The resin storage boxes can come in different colors to match your outdoor decor. They will be light enough to move when empty. Assembly will be easy and most will hold one or two butts when extra seating is needed. 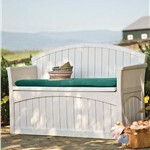 For more of my information on furniture with storage that will look like a bench, use this link. Several seating sets will come with ottomans that have storage under the cushion or seating area. This one from the Azalea Ridge collection will offer big storage area for several items. Items will not be completely out of the weather or protected from bugs or small rodents. They will offer some storage without getting away from your present seating decor. For a better look at this and other Azalea Ridge collection options, use this link. Rolling side tables can meet your storage needs with style. They will come in several colors to match any decor. It has a front door and one shelf inside to let you store towels or plates on separate levels. Use the top for a solar lamp or table top heater to enhance your sitting area. Heavy duty castors let you move the table to different locations with ease. Some side tables will have drawers in them for storage. These will not be weather proof or keep the bugs at bay. Even the little creatures in your yard will have an easy time getting in to the storage space. If left alone too long you could start a family of little critters in this space. This type of storage will not be for long term storage without some surprises. I did find one side table with storage that can be used as a cooler for those party nights. 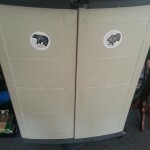 You will have storage under the cooler in a door for the extra party needs. 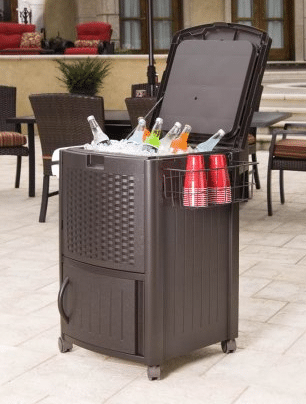 Open the top lid and you will find a place to put your ice and favorite adult beverage for party nights. Side racks can hold your red solo cups or other needed items. For more details on this storage solution, use this link. Resin Storage box's for outdoor storage will work the best for long term storage of all of your outdoor accessories that you do not want to leave out in the weather. These will be the best solution for keeping outdoor pest out. They come in vertical or horizontal for different storage solutions. 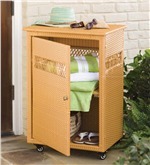 The vertical outdoor furniture with storage will look more like a sports locker to some. Some are big enough to store your push mower and other lawn equipment. For more information on my vertical storage solutions, follow this link. The horizontal will look more like bench with storage. They can come in over 140 Gallon capacities to hold quite a bit of pool toys or all of your cushions for outdoor furniture. For more information on horizontal storage solutions, see my post with this link. The larger rodents and other animals can be kept out with a lock on the doors. Insects and spiders will have a fun time making the dark inside home though. Setting a glue trap will be the best method of keeping spiders in check. If your storage needs are short term and you do not have large items to store, I would recommend the side table with wheels for your outdoor furniture with storage. It can fit many decors. It will not be weather proof or insect proof for long term storage. If you want to get things out of the way for a while or have some larger items that need to be stored when not needed, a storage bench will be what you are looking for. This is a duel purpose item and will give you several ways to use it. For the extremely large items a large vertical or horizontal box will be needed, these will be the best for keeping out small rodents and other pest. No outdoor storage solutions will be able to keep out all pest, you will have to be on top of your game to keep all pest out. Sometimes they will wear you out if they find your storage area a great place to live and raise a family. Any comments or questions, use the form below. Any products that you would like to see on this site, leave me a note and I will cover them. Thanks for the info, I personally like the resin storage box. I have one and it it works great! It keeps all those things I like to keep outside dry and safe. The resin storage box is a great choice to use for longer term storage. Thanks for the comments and looking at my post. If you need any help with your storage solutions let me know. We don’t have a garage or a basement at my house, so storage space is at a premium. We have a large horseshoe shaped bench on our deck. We haven’t gotten any cushions for it yet because we have no place to store all of them. Would a resin vertical storage box hold up to winters and snow? 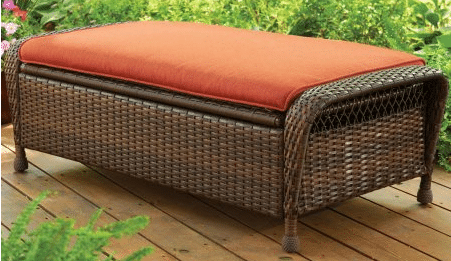 I am looking for something to hold (16) 24″ seat cushions. Thanks for your time, I look forward to reading your response. A vertical shed would be a great storage for cushions. Several are weather resistant, heavy rains may result in your cushions getting wet. See some of my suggestions on vertical sheds with this link. Now I live in a rented house, and the double car garage is doing a great job at storing all the gear. Will have to check in again when I get into my next home. Having a big garage to store things is a great advantage. Sometimes even if you have a big garage a storage bin close to the area that you have outdoor things makes it easier to store items out of the weather. I never thought of storing things outside. I don’t have a shed, so I always used my basement to store things. This is a great place to store things that you are going to use outdoors, like outdoor games or grill equipment. I really like the deck box with under cushion storage. Many people do not look at outside storage for their stuff. It is a great option if you do not mind the other things that sometimes get into your storage container. Hi John, Heavily into gardening when WA allows, love some of these ideas, it not only keeps things tidy, but out of site when have visitors. Storing garden or yard tools is a great way to use outside storage. Some of the vertical storage boxes will have places for hooks so that you can organize your stuff. Some cool ideas, it would be great to have a place to store the cushions when not in use, that way they won’t fade as bad. And maybe some of the other things that clutter the deck. Keeping the deck area clean of clutter when not in use will help with the ability to use it with out having to do house cleaning first. Keeping your cushions out of the direct sunshine will extent their outside life. Thanks for sharing John. I am really interested in the Deck box with under cushion storage as we have an above ground pool with a nice deck surrounding it. Would be a great addition as we are always looking for more storage area and can always use an extra seat or two when the family comes over. When the summer season is over, would you recommend bringing this back inside? We live in Ohio, and the winters can be brutal! Thanks again John. The deck box can stay outside in the winter, I would get a cover so the sun would not start to fade the finish. I would also bring in the cushion when not needed for seating to extend its life outside.